(Pulpit & Pen) In a startling move, a Romanist priest has preached a homily in which he relayed an imprecatory prayer for Pope Francis, contingent upon Francis’ obedience to God. Christians may occasionally pray imprecatory prayers, so long as they petition that God’s will (as opposed to their own) be done, and done cautiously in accordance to what we believe is God’s ultimate will, keeping in mind the hopeful desire of repentance and restoration for sinners. Jesus said “Love your enemies, pray for those who persecute you. Bless those who abuse you.” In light of this exhortation from Christ, we may be permitted to pray imprecatory prayers, so long as they are praying for judgment (which may correct), rather than full-blown damnation for those who oppose us. 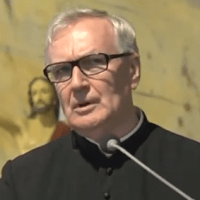 According to reports, Edward Staniek, 77, is a patristics scholar and rector of the Major Seminary of the Archdiocese of Kraków from 1993 until 2001. He was ordained to the priesthood in 1965 by Karol Wojtyła, now known as Pope Saint John Paul II, and has authored over 40 theological or catechetical books. He preached the message on February 25 in Kraków, and he claimed that the Pope had authority from Jesus by virtue of his obedience, and should his obedience become disobedience, he would have no authority. Ostensibly, on the mind of Staniek was Francis’ departure from historic Romanist teaching on divorce, remarriage, and human sexuality. I pray for wisdom for the pope, for his heart to open to the influence of the Holy Spirit, and if he doesn’t do it, I pray for his swift departure to the house of the Father. We can always ask God for a happy death for him because a happy death is a great grace.